Even before the cranberry industry collapsed and began making the news, my late wife Betty had been selected by Ocean Spray as a spokeswoman. She had a two page profile in the Boston Globe Sunday Magazine (a full page picture no less), and did a segment for the Sunday Today Show and another for New England Chronicle and Rebecca's Garden (which you can view on the blog). In fact the later TV piece was still being aired around Thanksgiving eight years later. At first I did an us-and-the-media webpage just to send to our friends and family. I kept it up, neglecting to link to a few articles here and there when I lost interest from time to time, mainly to document for myself our weird life here, so different from the decades we spent in Michigan where I was a psychotherapist and Betty was a librarian. Nothing much happened between November of 1996 and April of 1999 in the cranberry industry. But then one thing led to another little world of Ocean Spray and cranberries, cranberry prices crashed, and it became apparent that Ocean Spray's mismanagement had been largely responsible for this. Before I knew what hit, Cranberry Stressline went from being about plain old farm stress, to being political and controversial. First the website was covered in the local media, then the reporters started calling from around the country, including the New York Times and Forbes. Both sent reporters to interview us. 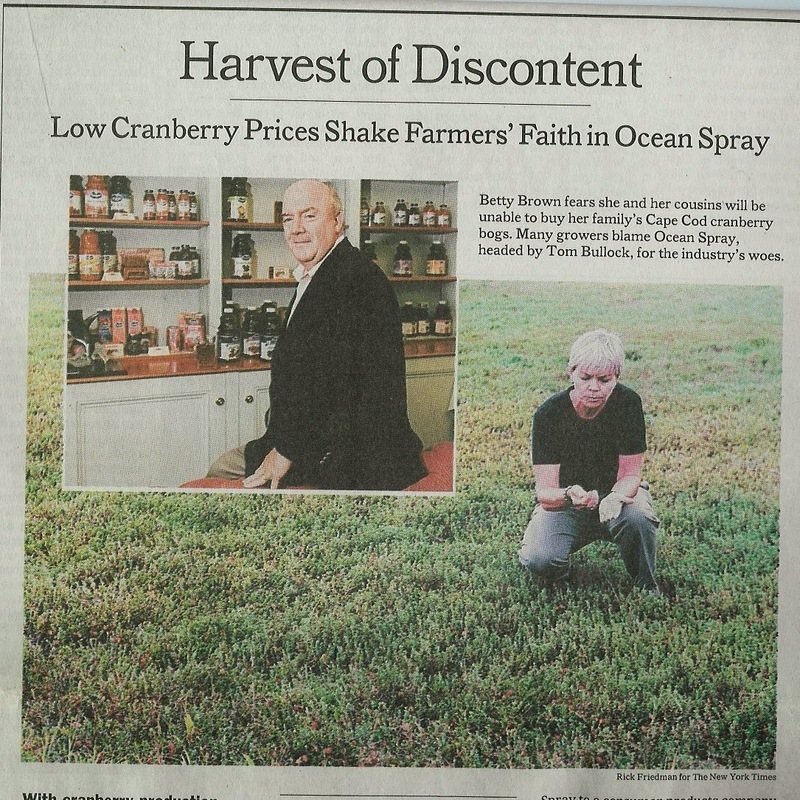 Along with a long article, Betty was pictured on the front page of the Sunday business section of the New York Times with the Ocean Spray CEO. Is it a dream I asked? Pinch me. Is it real? Are we really farmers that created something called by the shorthand "Stressline" that just about everybody involved in the entire beverage industry knew about and read? Of necessity, to promote our cause, we became Shameless Media Hogs.